You can travel far and wide across the internet and find any number of statistics touting the thump in Joey Gallo’s bat. It’s legendary power that doesn’t deviate much from players like Aaron Judge, Giancarlo Stanton, and J.D. Martinez, no matter how much offseason buzz and the Big Apple may suggest otherwise. When I started to chop up Gallo’s stats on various parameters, my intentions were simple: consider whether a better version of Gallo could exist. The idea of adjusting a power hitter’s strikeout rate to foster greater productivity isn’t new and neither is it innovative, but it’s something I always kick around in my head with big bats. I remember watching Kris Bryant on ESPNU (do you remember that thing called cable?) mash for the University of San Diego when I was just a young lad and falling in love with his swing. When he debuted in 2015 with a 30 percent strikeout rate and a .375 BABIP average to buoy his .275 average, I backed off. That was a mistake. The next year Bryant cut his strikeout rate by over six percent, refining his peripherals into a drastically new hitter. Then he did it again, cutting his swinging-strike rate by another three percent and posting an OBP north of .400 in 2017. I learned quickly to never doubt Bryant. We often say to learn from our mistakes, but I’m torn with where to take my affinity for Gallo. On one hand, he’s a different breed of power hitter, with a swing-and-miss problem that I don’t anticipate ever falling below 30 percent. But the pedigree in his bat was once considered similar to Bryant and I love Gallo’s swing for different reasons than Bryant’s. The Cubbie was, and is, compact in his approach. Gallo was, and is, extremely aggressive in coiling his 6-foot-5 body to generate unbelievable bat speed and power, even with some inherent length to his swing. That length is one reason why we see what I’d like to call “Mount Gallo” below. Gallo’s swinging-strike rate is grotesque, tied for worst in the majors last year with Javier Baez, and Gallo’s 20-game rolling average peaked around midseason at a mind-boggling 26 percent. 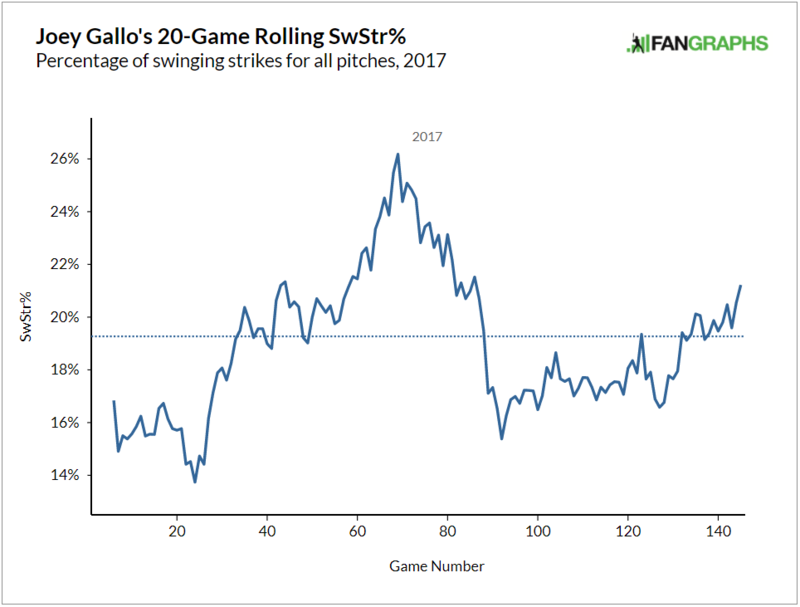 Then Gallo stopped seeing breaking balls at a rate above 30 percent in a small sample of games during July (right around game number “80” in the graph). Coincidentally, one pitch Gallo struggles to produce against is the slider (-1.27 pitch info pitch value/100 on Fangraphs). This presents itself as one of the drivers for Gallo cutting down to a manageable swinging-strike rate for a short period of time. But the thought is somewhat fleeting given the reversion back to above 20 percent come season’s end (game number “140”). While I cite swinging-strike rate in Mount Gallo above, it’s important to understand the variables that lead to a swing-and-miss hitter. Gallo’s out-of-zone contact rate is one of the main issues, but during the same block of time where Gallo’s 20-game-swinging-strike started to descend from Mount Gallo, his outside-zone contact rate rose to just below 50 percent. Something clicked, and even if it was for a short period of time; merely a blip, it shines a light on what Gallo needs to adjust in order to push ahead of his sub-.210 average. You wouldn’t anticipate a player of this size having problems with plate coverage, but given the path of Gallo’s bat through the zone, he’s trading his light-tower power for the ability to cover areas of the zone other 6-foot-5 hitters can. Given that Gallo is a relatively patient hitter (near league average swing rate at 47%), the lack of an average ability to make contact when he chooses to swing may tie to how deep he gets into counts with his patience. Breaking balls are thrown more with two strikes than one or two. While it’s easy to suggest that Gallo should simply be more aggressive, as I detailed in a post of mine for BigThreeSports, that aggression is going to drag down his walks. It’s a double-edged sword, and for a hitter with flaws, like Gallo, to find a balance is a tall task. Even though out-of-zone contact ability may not produce the highest quality of contact, I still see it as a sign of development from from Gallo; one that could make Gallo a better version of himself. This mental exercise allows me to apply what my doubt of Kris Bryant taught me: never toss the possibility of adjustment completely out the window. Although I don’t put nearly as much stock in such a small window of change with Gallo, I have a hard time dismissing the potential for further adjustment by elite talent. Gallo’s ability to positively adjust his out-of-zone contact rate and general contact rate as a whole is key. As he creeps into the prime years for hitters to trend up in their discipline and contact profile, the direction of these contact and discipline metrics and their components will dictate the legacy he leaves. Your fantasy team could reap the benefits of potential adjustment come late March. I consider Gallo in a class of players that are strictly owner-dependent. Some hate the idea of taking such a hit in average. Others want to build around the few players with legitimate 40-homer power. (In the few mock drafts I’ve done with Lawr Michaels this offseason, he seems to be a subscriber to this belief). Using Razzball’s Player Rater, here is the pure dollar value Gallo produced last year. That nets a total of $13.8, placing Gallo 88th overall, just behind Yasiel Puig and Wilson Contreras. I phrase it in terms of dollar value per category because I want to emphasize the net effect of having an average this poor from a hitter. This would give him the following dollar values for each offensive category according to last year’s standards. This nets out to $15.2 of value, which would bump Gallo roughly 10 spots on 2017’s overall roto leaderboard, to 78th overall (close to 2017 Mike Moustakas). Steamer assumes about a 2.5 percent drop in Gallo’s strikeout rate in his age-25 season. Likely driven by what I speak about above: Gallo’s contact profile crawling along the standard aging curve and improving along with his discipline. If you want to buy into a more Bryant-esque change for Gallo, then paying middle-of-the-eighth-round value for a player who can touch 45 home runs with the profile shown above, can return substantial value on your investment. I can be found on Twitter – @LanceBrozdow. Where I enjoy GIF’ing up hitter adjustments (like this one!) and posting all of my baseball-centric, written and spoken content. FOLLOW ME! Wow, great write-up man. Thank you. I did my first dynasty draft… wondering how I did. 12 team 40 man rosters, 2 catcher and SV+HD. Love to hear what I need to improve or do better next time. You’re the only one I listen to now! Thanks! Man, don’t think I can critique too much, I like the squad. I’d say you probably could’ve gone with a little bit more youth at the top end of your talent base, but the balance in how good you minor leaguers are cancels that out for me somewhat. My best advice is to simply get reps with leagues and drafts and see what you like/dislike about squads; adjust from there. Everybody has their own dynasty style! @Lance: got offered Harper and Kingery for Ohtani and Harper? Pull the trigger? Thanks! Assuming a typo and that you’re giving Ohtani and getting Harper/Kingery? Because that’s a slam dunk on the Harper side. @Lance: Ah shoot I messed that up… It’s supposed to be Freeman with Ohtani. Good stuff Lance Romance. I did a quick peak at his splits and noticed he had a drop in his FB% in August and what could be called a massive drop in September. His last three months saw him with his lowest FB% and his highest LD%. As you said above about adjustments, could that be a snap shot of more to come. I always found it hard to evaluate the September numbers with intangible factors like fatigue and your team not playing for the playoffs factoring into guys drop in performance. You bring up a lot of good points here JFOH. I’m going to save my thoughts for later cause I want to give a thorough response! Give me a few hours!!! Aight here we go boss haha…. Sept. numbers are really tough to evaluate, I have trouble with that as well. The smartest thing to do is just take the aggregate season and project outward, instead of sampling months, but f that hahahaha that’s no fun!!! Regarding Gallo, there seems to be varying points of his season that singal weird things like this, including the drop in SL usage against him, which although is a small sample, really confuses me as I don’t get why SPs or RPs would adjust that approach midseason when his rolling K rate was near 35% at times. 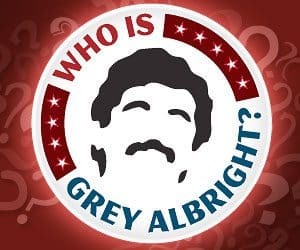 I’ll try to answer each of those questions, because I’m a lunatic (haha), and even though they’re likely all rhetorical…. 1) That’s the holy grail, I’d be yes, but with reservations because it started to deteriorate. 2) League adjusting to Gallo will be very, very easy with his plate coverage deficiencies. It’ll be a matter, for me, of how he tinkers with his patience; how much walk rate is he willing to sacrifice for a few more dingers, or at least shots at a few? 3) Hitting coach analysis is something I’ve never really gotten into. If I were to, I’d immediately want to know who is more statistically inclined versus those who aren’t, and subsequently, what kind of player Gallo is on the same spectrum. A hitting coach could work wonders for one guy and not for another and I wouldn’t be shocked at all. You probably have more knowledge on this than me! Impressive write-up, I believe in Gallo! Trade advise : i give arenado for j.d. mart and a 1st rd pick. I already have rendon. We keep 6 from last yr roster. Is gambling for a 1st rd and j.d. mart worth risking arenado ? So 6 keepers across – taking a guess here – 12 teams means a first round pick is anywhere from 60-72 overall. So you’re effectively getting JD and a guy like Tommy Pham or Elvis Andrus along with JD for Arenado. This would come down to who is at the top of the non-kept list. My guess is that it’s a lot of older talent, aka, valuable for 2018, but not great long term (think Cruz, etc). Lot of ways to look at questions like this. If you’re contending NOW, I might entertain, but all in all, I’m probably keeping Arenado. There are like 2-3 players I would trade Arenado for, and have a hard time justifying packages around supreme talent unless I’m moved. In this case, I’m clearly not. Yes. 12 team. Funny you mention pham and andrus. They are both on my roster from last yr and i am deciding on keeping only 1 between pham,andrus, or going further on a limb with d.d. gregorious or eddie rosario. But arenado i agree. Thanks much for the inout. Great column !! What do you think Gallo should be ranked overall? 75? I would take Gallo around 75-80 overall, yes. He’s currently 114ish on NFBC ADP and I think that is fantastic value for what he will provide in the aggregate. He is pretty athletic, I think he can swipe 10ish. Lot of variability in steals with a guy like this, but he walks enough where I think it could be a non-zero asset. The OF metrics might be due to a small sample. He only played 18 games there, and although I don’t have the numbers on how quickly that standardizes, it’s an interesting case to make. If you think he’s a lock for 40 HR, then he’s a top 50 player for you, that’s aggressive, but I like it. Also don’t think twin towers is a good nickname for Stanton/Judge…. just saying….